Een vertaling om het Nederlands van het powerpointmateriaal dat daarbij gebruikt wordt tref je onder deze link aan. Veel plezier met het beantwoorden van de vragen. Attitudinal Healing and Addiction Treatment, Healing Trauma in Children, The Scientific Basis of Attitudinal Healing, Trusting Inner Wisdom, Conflict Resolution, Overcoming Loss and The Eternal Quest for Happiness. You may use this link to register for upcoming and previous webinars. Zoek je een Attitudinal Healing-groep om aan deel te nemen? Attitudinal Healing trainers and presenters from around the world will share their wisdom and creative Attitudinal Healing programs in a series of online webinars offered on the third Tuesday of each month throughout 2018. Times will vary based on the location of the presenter. We hope you join us for the next session in this exciting series! There is no set fee to attend this online webinar. Instead, we request a donation on a sliding scale of $10.00 to $50.00. Your one-time donation will serve as your webinar registration and support CECURA Guadalajara, as well as the development of future AHInternational online programs. This webinar will be recorded and available for replay after the live session. Space is limited – please register before Tuesday, 10 July 2018. No one will be turned away for lack of funds. If you have questions, or are unable to register via credit card, please contact Trish Ellis at trish@ahinternational.org or call (877) 244-3392 ex. 702. Carlos Aguirre, M.D. is a psychiatrist with a Masters degree in Family Therapy and in Child Psychiatry. He is a member of the Mexico Board of Psychiatry, and also holds a specialty in Holistic Medicine (Homeopathy). He has dedicated his professional life to private practice and lecturing, and has been especially interested in training non-professional people with the intention to expand psychological and spiritual knowledge to those who are interested in their personal growth. 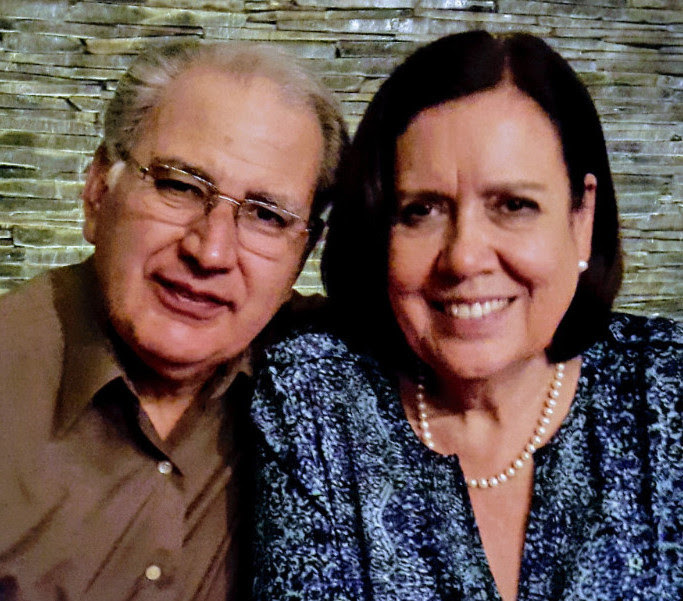 In 1994 Dr. Aguirre and his wife Lucero, together with professional and nonprofessional persons, founded the Attitudinal Healing Center of Guadalajara, Mexico (CECURA GUADALAJARA). Through the work of the Center, he has integrated the practical concepts of consciousness development into his private practice in Family and Marriage Therapy and facilitating self-help groups. Lucero Aguirre is originally a teacher in bi-lingual education and has a Masters degree in Psychology. She is also certified in Thanatology (the scientific study of death). Professionally she has always been oriented to the innovation of teaching techniques and service to others. In 1994 Lucero, together with her husband Dr. Carlos Aguirre, founded the Attitudinal Healing Center in Guadalajara, Mexico, where she has been dedicated to facilitating self-help groups especially with people in life crisis. Lucero personally accompanies individuals and families through traumatic and complicated mourning. She frequently gives lectures and workshops on the grieving processes, forgiveness and spiritual development. She has also expanded Attitudinal Healing into other institutions including hospitals, schools and prisons. Onderstaande mail kreeg ik op 12 juni 2018 van Jerry Jampolsky. Graag wil ik zijn bericht met je delen. 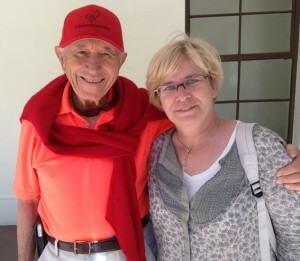 Jerry Jampolsky, here, writing with boundless love and gratitude for our connection in life and in spirit. I was guided to share a poem of mine with you, and would like to tell you a bit about it before you take a moment to listen to the recording attached in this email. I wrote this piece, entitled “Jesus, At Last I Have Found You” in 1976, one year after I was introduced to A Course in Miracles and turned away from my Atheist belief-system. Having been raised Jewish, the name Jesus was not a part of my vocabulary, and it was not without effort that I was able to eventually accept Jesus in my life. I have since done so, and am happy to share with you the poem I was guided to write in the midst of that spiritual transition. As you may or may not know, I am legally blind in both eyes, and am no longer able to read from a page. I am, however, a firm believer in not being limited by my blindness, so what you will hear in the attached recording is my voice, reading one of the poems that is closest to my heart. You may wonder how I could read this to you, without my vision. I was blessed to have my wife, Diane Cirincione, read me one line at a time, which I would then repeat into the microphone. The studio we have been recording with (Loose Arrow Labs) is in El Cerrito, CA. The owner and engineer is Stu Lucero, who I was referred to by my life-long friend Trish Ellis when I needed a caregiver. Stu has become an intimate member of our family, and is now one of our closest friends. As our sound engineer, Stu was able to splice the recorded audio and make the reading flow for the listener. As a result, it can be heard as though I am there by your side, reading to you personally. This means the world to me. To be able to share my words, my conversation with Jesus, in my own voice at the fresh young age of 93, is incredibly special to me. I hope that you will enjoy listening. There is no set fee to attend this online webinar. Instead, we request a donation on a sliding scale of $10.00 to $50.00. Your one-time donation will serve as your webinar registration and support Stichting Centrum in The Netherlands, as well as the development of future AHInternational online programs. This webinar will be recorded and available for replay after the live session. Space is limited – please register before Tuesday, 12 June 2018. Finding your own answers is the most clever thing you can do, since you keep yourself company all the time and can be fully trusted. For example, if you want to know if you like strawberries, it is wise to taste them yourself and decide if you do, rather than depending on what someone else tells you about how strawberries taste. In this same way you can “taste” your life right now and decide what is most suitable and most helpful for you at this time. It is okay to trust yourself completely, and, if needs be, to choose again. None of her studies could satisfy her in this regard until she read “A Course In Miracles” and was introduced to Attitudinal Healing — both provided her with the answers she was looking for. For more than 20 years Els has been giving trainings and workshops on ACIM, Attitudinal Healing, and family-constellations, both nationally and internationally. 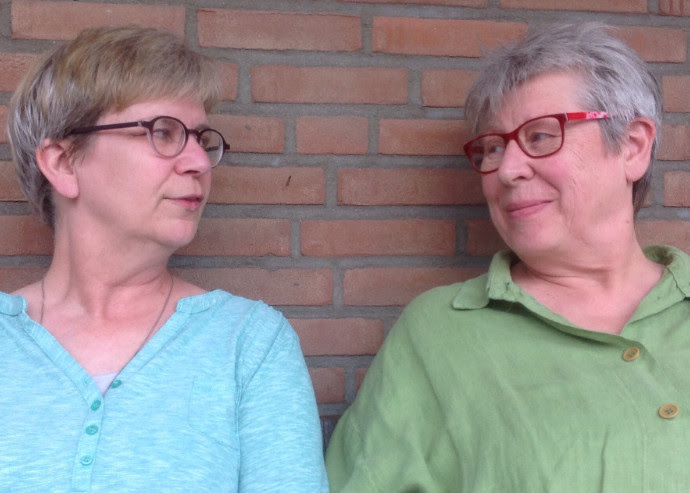 Emilia van Leent (left) started her career as a teacher, then moved on to psychiatric nursing, which she has now practiced for nearly 30 years. Both ACIM and Attitudinal Healing were a life-saver for her and she uses the profound truth of both in the treatment she offers her clients. There is no set fee to attend this online webinar. Instead, we request a donation on a sliding scale of $10.00 to $50.00. Your one-time donation will serve as your webinar registration and support CECURA Monterrey, as well as the development of future AHInternational online programs. This webinar will be recorded and available for replay after the live session. Space is limited – please register before Tuesday, 08 May 2018. In this webinar, Juan Manuel Aldape Castillo and Angelia Carrillo Flores from CECURA Monterrey will share their New Facilitators Training Program. This webinar will be presented in both English and Spanish. There will be time for questions and answers at the end of the presentation. Juan Manuel Aldape Castillo is certified by the Neuro-Linguistic Programming (NLP) and Coaching Institute of California. He has professionally studied NLP, Human Development, and Group Facilitation for learning experience. He worked as a Consultant in Human Processes from 2006 to 2014, providing services to different businesses and companies. He has worked for over 30 years in Monterrey, Mexico according his profession; his certification includes Mechanical Electrical Engineer by ITESM, with subsequent studies at IPADE, Stanford University USA, and AOTS in Japan. Argelia Carrillo Flores studied Sociology at the Universities of Dayton and Boston University. She is a certified teacher in the English language and, after dedicating 30 years to teaching, she has recently expanded her studies in the areas of Human Development, NLP, Emotional Intelligence, and Enneagram. 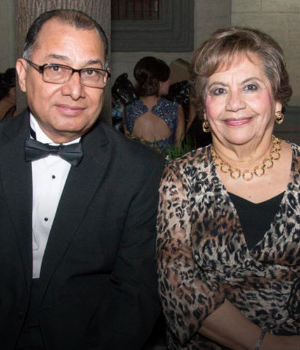 Both Juan Manuel and Argelia have been dedicated to accompanying and supporting the development and growth of people since 2005, and have served as Directors of CECURA Monterrey since 2007. There is no set fee to attend this online webinar. Instead, we request a donation on a sliding scale of $10.00 to $50.00. 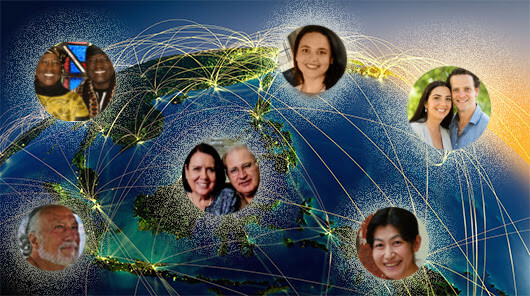 Your one-time donation will serve as your webinar registration and support Attitudinal Healing Connection Oakland, as well as the development of future AHInternational online programs. This webinar will be recorded and available for replay after the live session. Space is limited – please register before Tuesday, 10 April 2018. 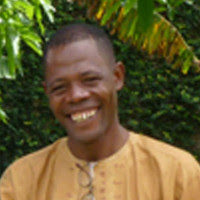 In this webinar, Tasha Abdou and Marie Abanga from Attitudinal Healing Cameroon will share their award-winning implementation of the Attitudinal Healing Power to Choose Youth Program, as a model for empowering compassionate future leaders. There will be time for questions and answers at the end of the presentation. Tasha Abdou is a teacher, trainer, coach, facilitator and program operations manager, with advanced expertise in secondary and high school education, curriculum design and cross cultural relations. Tasha learned of Attitudinal Healing in 2002 at a low point in his life, when he spent the last money he had to buy a copy of the book “Love Is Letting Go Of Fear.” In 2011, he and a few friends formed the Cameroon Centre for Attitudinal Healing, and in 2014 he received the Jampolsky Award for his innovative implementations of the Power to Choose Youth Program. A lawyer by profession, Marie Abanga is equally a consultant, a dynamic and passionate advocate of Women’s rights, a mental health advocate and wellbeing coach, a motivational speaker, and an author. 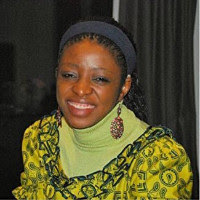 As a consultant, Marie has managed the African Region of the Women In Parliament Global Forum and collaborates with the Black European Women’s Council. Marie joined the Cameroon Attitudinal Healing Center in September 2017 following a referral from an Attitudinal Healing International member based in the USA. 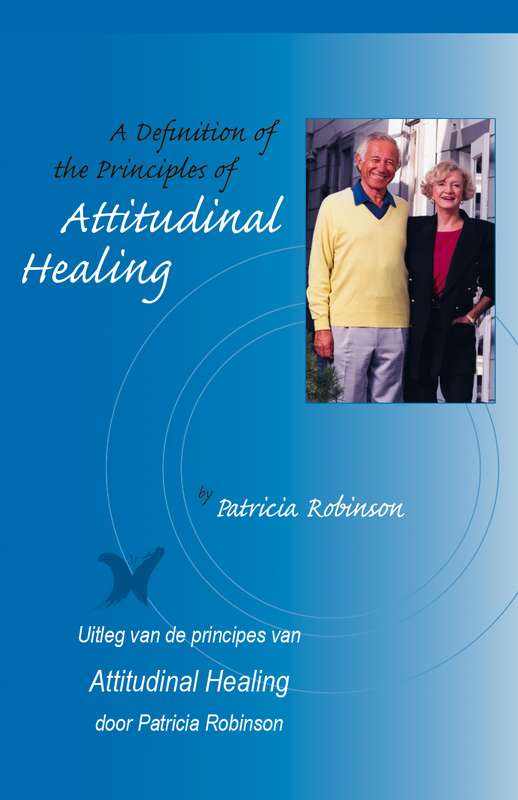 Patricia Robinson werkte jarenlang in het eerste, door Jerry Jampolsky opgerichte, Centrum voor Attitudinal Healing in Sausalito. 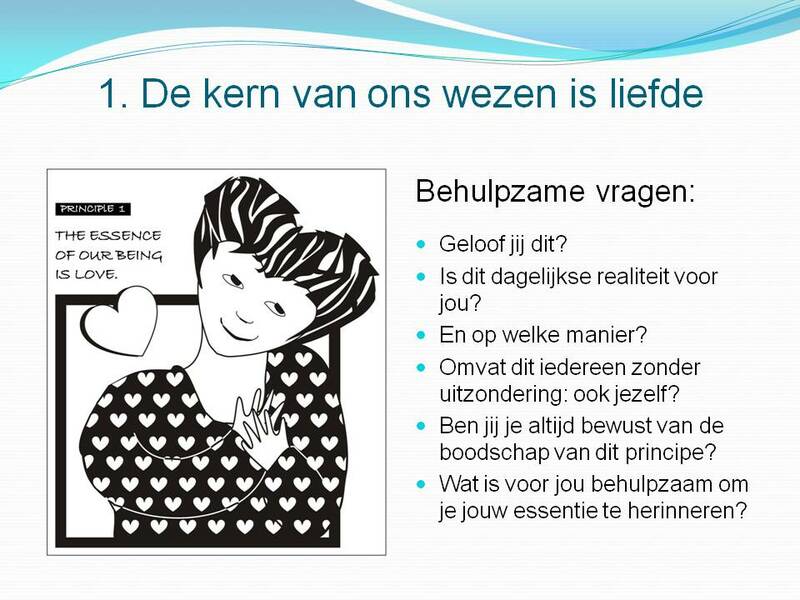 Ze verwerkte haar aantekeningen in een boekje met uitleg over de principes van Attitudinal Healing en het ontstaan van het eerste Centrum. Hier vind je in PDF de Nederlandse vertaling van dat boekje. UTRECHT-Amerongen: Nida Zegers * NOORD-HOLLAND-Bovenkarspel: John Buijsman * LIMBURG-Echt: Peter Winteraeken * ZUID-HOLLAND-Leiden: Jeanette & Fernand Pierre van Os * Kijk voor meer informatie bij attitudinal healing / attitudinal healing-groepen! Wil je op de hoogte worden gehouden van nieuwe berichten? Vul dan je e-mailadres in. Of volg via Twitter. De principes van AH op postkaarten! Handig voor in de groep of gewoon om te verzenden. 12 kaarten voor € 3,00 (excl.verzendkosten) . Meer informatie: kijk bij principes & richtlijnen!